In the finger lakes region of New York there is a village called Geneseo. In this village, down a gravel road, there is an airfield with a grass runway. On this grass airfield, for one weekend every July, one of the greatest gatherings of warbirds in the country takes place. It is called “The Greatest Show on Turf”. 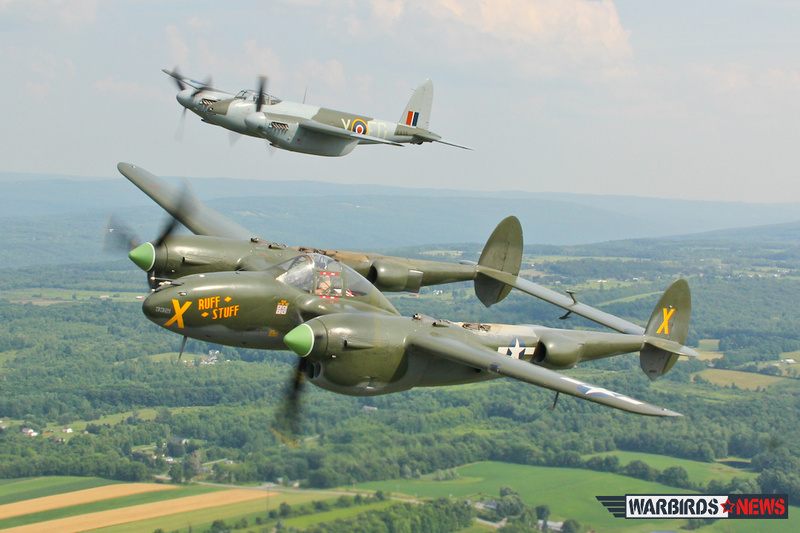 The Geneseo-based National Warplane Museum hosted warbirds this year from both the US and Canada, including many rare aircraft. 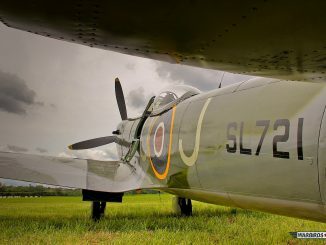 Warbirds headlining the show included the Military Aviation Museum’s de Havilland DH-98 Mosquito, Fagen Fighters’ Lockheed P-38J Lightning “Rough Stuff” and the Canadian Warplane Heritage Museum’s Westland Lysander Mk3A. 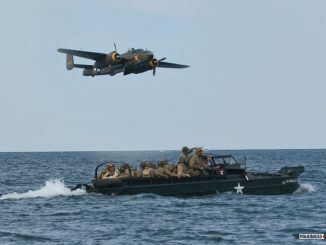 The National Warplane Museum’s “Return to Normandy” project was also a major theme for this year’s show. 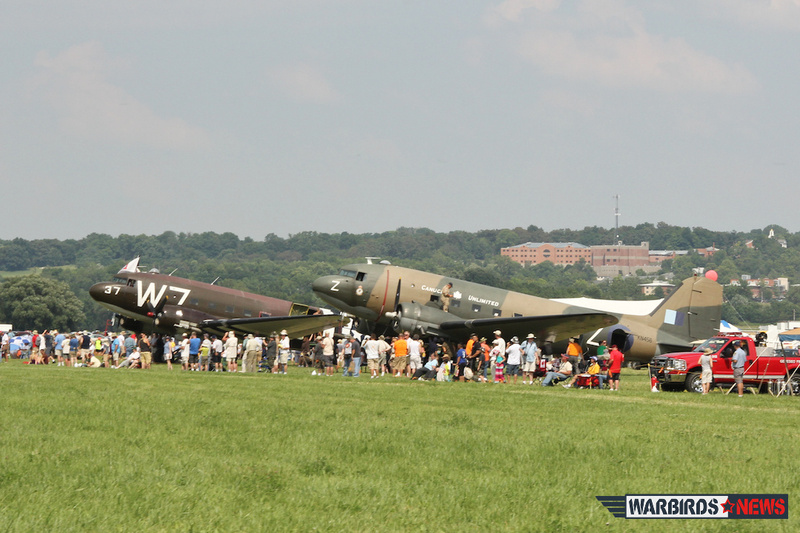 Their Douglas C-47 known as “Whiskey 7” made the grueling trip back to Europe this June to participate in the D-Day 70th Anniversary celebrations. A D-Day veteran herself, “Whiskey 7” lead the second wave of paratroop drops on Normandy, France on June 6th, 1944. On that day she dropped seventeen men of the 82nd Airborne Division on a drop zone near St. Mere-Eglise. This past June, she again dropped paratroopers of the 82nd Airborne and the Liberty Jump Team on the same drop zone to commemorate the 70th Anniversary of D-Day. 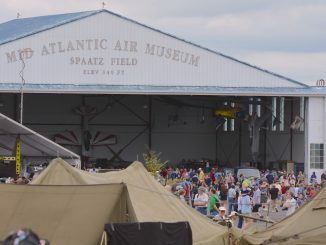 The 2014 edition of “The Greatest Show on Turf” began with the replica WWI aircraft of The Great War Flying Museum in Brampton, Ontario. A British Sopwith Strutter and a French Nieuport duked it out with the Red Baron’s Fokker Dr. 1 in a mock aerial dogfight. This performance led quickly to fly-bys from the L-birds, then fast and slow classics, Stearmans and Texan/SNJ/Harvard. 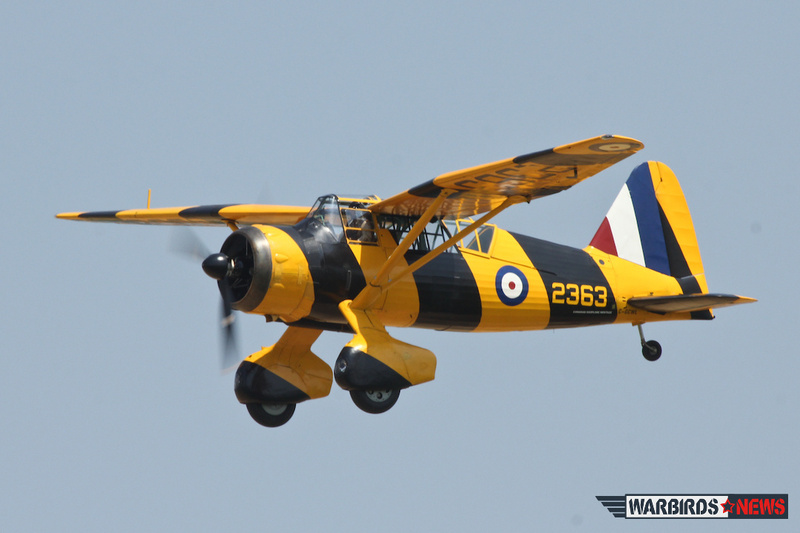 The Lysander, Lightning, Mosquito and L-39 Albatross also flew solo flypasts as well. Rob Holland flew aerobatic routines in his MX2, and the father and son team of Andrew and Eric Boyd performed in their Pitts Specials. Warbird aerobatics followed with John “Skipper” Hyle in his Harvard, Scott “Scooter” Yoak in his P-51D Mustang “Quick Silver and Mark Murphy in the P-51D “Never Miss”. Midway through the show the crowd joined in with a A Salute to Veterans of all services from the United States and Canada. The organizers invited all veterans present to show center for recognition by the audience. While the Canadian and American National Anthems rang out, a missing man formation with two Mustangs, a Corsair and the Lightning passed overhead. 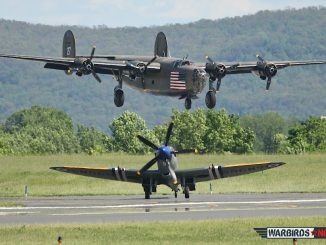 The second half of the show included a Corsair and Japanese Val dogfight while a B-25 Mitchell bombed the airfield, complete with pyrotechnics. In honor of the 70th Anniversary of D-Day, “Whiskey 7” dropped the Liberty Jump Team while two P-51 Mustangs flew top cover. The Liberty Jump Team dresses in WWII uniforms and equipment, but uses modern parachutes for safety. Between flying acts there was plenty to fill the time, including an antique/vintage car parade and a military vehicle parade. On Saturday a group of over fifty Viet Nam War veterans on a cross-country motorcycle trip made the air show one of their stops. They quickly put together a motorcycle parade which the Geneseo crowd enjoyed greatly. Living history re-enactors, complete with mess tents, hospital and a motor pool provided commentary on life in the service during WWII. Dressed in accurate period clothing, they added the human element as they posed for photographs with historic vehicles and aircraft. 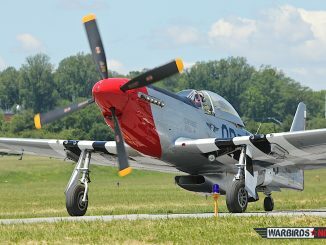 The Geneseo air show has long appealed to spectators, because of its intimate feel. The crowd isn’t separated from the aircraft and pilots, unlike many other shows where the planes are parked on a ramp far away from the crowd. At Geneseo the spectators mingle with the planes and pilots. When aircraft must fly, a crew of volunteers and Civil Air Patrol cadets direct the crowd to a safe distance, but still give the spectators close-in views as the planes start and taxi to the runway. 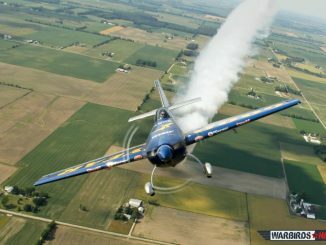 For those that are not air show enthusiasts, the Geneseo Rotary Summer Festival and Sidewalk Sales were also going on during the same weekend. Outdoor concerts, arts, crafts and food vendors filled the Village Park and Main Street. On Friday night, the Rochester Philharmonic Orchestra performed its Summer Spectacular with evening fireworks. Add this to “The Greatest Show on Turf”, and you come up with a fantastic summer weekend for the whole family. 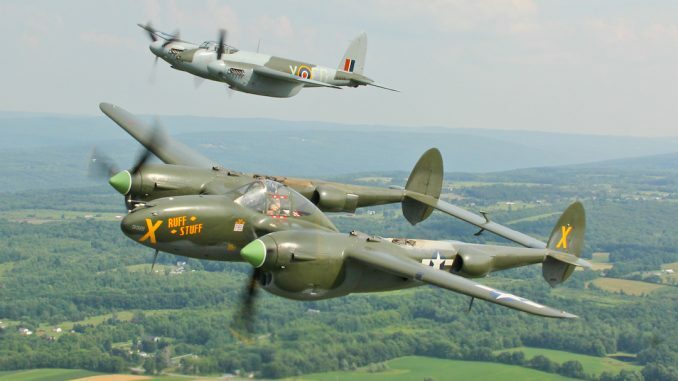 Lockheed P-38J Lightning "Rough Stuff"